As part National Cybersecurity Awareness Month I wanted to show you how you can share your Public PGP key on Facebook. 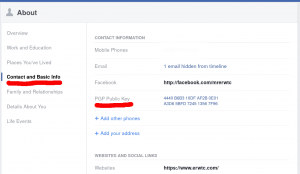 It is surprisingly easy to add your PGP on Facebook which is a good thing for you. One of the downsides of using Asynchronous encryption is sharing your public key with others. Which is awesome that you can share it via Facebook which has the majority of your connections. In this tutorial I will be showing you how to add an existing public key. If you don’t have key pairs yet, check out Keybase which makes easy to create your own PGP key pairs. Click on the “Edit” button to add your Public key. Inside the text box add your Public key and chose who you want to share it with (Only me, Friends, or Public). Again share only your Public key! Click the blue button “Save Changes”, Facebook will ask for you password to confirm the changes. That’s it! You now added your Public key to share with your Facebook friends.